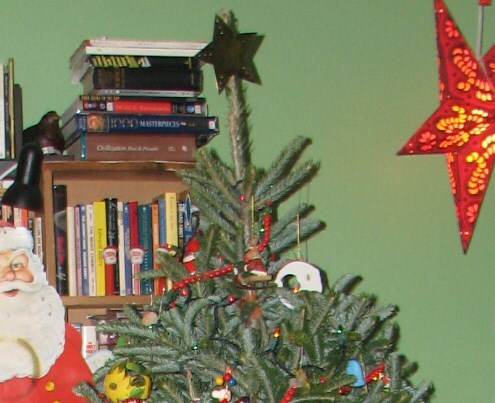 Hugh, over at Hugh’s Views and News, is sponsoring a Christmas charity event–for every person who blogs a photo of what’s on top of their Christmas tree he will donate £1–up to £250. That’s about $390 bucks in US Dollars–a significant amount. So, all you need to do is to snap a shot of the top of your tree–whether it’s a star, an angel, or a bobblehead replica of NASCAR star Rusty Wallace in a cocktail dress–and link back to Hugh’s post, where he’s helpfully included specific directions that cover whatever I’m forgetting. This entry was posted in Uncategorized and tagged angel, charity, christmas tree, donation, help, star, what. Bookmark the permalink. 2 Responses to Here’s what’s on Top of my Christmas Tree – what’s on Yours? Thank you so much for participating in my charity Christmas tree topper challenge. That tin star on the top of your Christmas tree is in the perfect place for this festive season and looks right at home at the very top. Many thanks for helping me get a little nearer to my charity target of £250 by twelfth night. I really do appreciate you joining in on the challenge.